Akit's Complaint Department: Muni's All Door Boarding - Good Idea! Muni finally considers legalizing rear door boarding for buses. Gees Muni, it took all these years to think of that? It took them long enough to get Muni tickets for fare evasion and other minor crimes to be decriminalized because it hogged-up the local Superior Court's time to face a judge. Speed up boarding times, therefore reducing bus idling. Faster boarding also means quicker buses (average speed of Muni is 8 MPH). 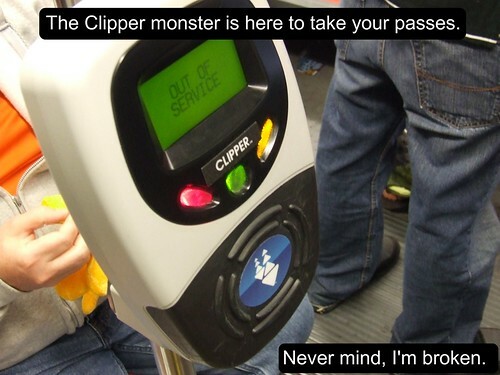 With more passengers using Clipper, utilize the back door Clipper readers. Increased cost to have more fare inspectors checking more than just the metro system. Alleged discrimination by minorities and the poor because of past allegations by members of the public that the fare inspectors are targeting them. Belief that going all door boarding will be a transit system where people can ride for free all they want. It's very beneficial to have all door boarding on the most heavily used lines. The heavy lines I would suggest Muni should allow all door boarding would at least be the 38-Geary, 38L-Geary Limited, 8X-Bayshore Express, 30-Stockton, 45-Union-Stockton, 14-Mission, 49-Van Ness-Mission, and 47-Van Ness. It seems relatively pointless and wasteful to enforce it on the smaller lines like the "community service" routes like the 17 and 36, and other routes with not much heavy usage like the 2-Clement and 18-46th Avenue. If Muni keeps regular boarding procedures for the lesser used lines, this means less cost to the agency for fare inspector teams so they can target the heavy lines. One line I would definitely not allow Muni to do all door boarding would be the F-Market. Tourists don't know about all door boarding and would think boarding the back door would be a free ride on Muni. Most of the tourists I notice pays cash for their rides. Muni would better benefit with investing in ticketing machines at major stops to help facilitate faster boarding through the front door. Muni also doesn't have Clipper card readers on the back doors of Milan trams, and that would mean thousands in installation costs extra. Plus, because the cars are quite old, people could accidentally damage the rear doors by holding or forcing them open. As for so called discrimination claims by people targeted by fare inspectors, I think that's a bunch of junk. Everyone pays to ride, no matter what ethnicity or how much income you have. As Muni says, "pay your fare share." If Muni goes with all door boarding and their fare inspection teams will target lines with heavy fare evasion, it's not because of ethnicity, it's because Muni wants to change the attitudes of people to not steal from the taxpayers. The SFMTA Board wants to consider making Muni a cashless system. This almost sounds impossible to do with hundreds upon hundreds of bus stops and would therefore hurt people who rarely ride Muni and tourists. They would have to spend millions installing pre-pay ticking machines if they want the entire system to have no cash accepted onboard vehicles. I think this is a foolish idea because you shoo tourist dollars away from a cheap $2 ride to go anywhere in the city. If Muni wants to go with a better method, remove the driver element from the fareboxes and put in self service machines in each bus where passengers can pay cash to the machine and get a transfer that spits out from the machine. By doing it this way, people can line-up inside the bus while the bus is in motion to pay the fare. San Francisco Transit Riders Union wholeheartedly supports and has supported all-door boarding. Please email all-door-boarding@sftru.org if you want to help us make it a reality.